Fire Truck Transfers - Ride aboard a real Fire Truck! 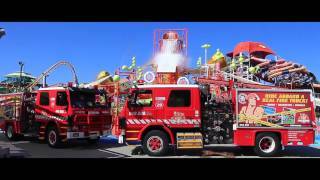 Fire4Hire have a fleet of 7 Fire Trucks, each seating up to 10 passengers each in comfort. Each truck is equipped with a great stereo system, refrigeration for drinks on board, and a huge amount of storage for luggage. This is more than a regular, plain limousine service! The pump and hoses are operational and guests can experience use of a fire hose to give a unique and memorable experience during their booking. Transport services include: Airport, Hotel, Theme Park Transfers, Special Events, Concerts, and Corporate Functions, Hens and Bucks, Birthday Parties, and School Formals. Imagine the excitement and surprise as your very own Fire Truck arrives to collect you! Servicing Gold Coast, Brisbane and Northern New South Wales. Have a uniformed driver collect you from your preferred pickup point and then enjoy transfers aboard a real Fire Truck! Large luggage (surfboards, golf clubs, strollers, prams etc) are no problem with huge storage available onboard. 10 passenger capacity per truck. Groups of up to 40 passengers can be accommodated aboard their fleet of four Fire Trucks!